Shop with printable coupon at any U.S. Charming Charlie store location or with promo code at U.S. Charming Charlie online and enjoy the savings! Take $10 off your purchase of $30 or more. Or, take $20 off your purchase of $55 or more. 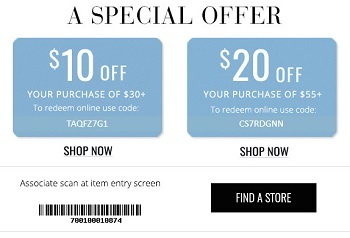 You can get your coupon through Charming Charlie emailing. Offer is valid through February 25, 2017. Source of the information is Charming Charlie. More details available at any U.S. Charming Charlie store location or Charming Charlie online.